Every Bible reader knows the story of the prodigal son. He became dissatisfied with things at home, asked his father for his part of the inheritance, and took off for a distant country. There he wasted his estate on wild living. See Luke 15 for details of the story. I have often wondered if the young prodigal went away to the region of Decapolis. A city like Jerash doesn’t seem that far today, but we must remember that most people likely walked or used donkey transportation in those days. Jerash would provide a wonderful opportunity for a boy away from home for the first time to become involved in loose living. Most of the ruins at Jerash belong to the second century, but it is not difficult to imagine an impressive city there in the first century. The forum at Jerash. Photo by Ferrell Jenkins. Another story worth considering has come to my attention. About 100 years ago Adolf Deissmann wrote Light From the Ancient East. He demonstrated how the Egyptian papyri illustrates New Testament teaching. In fact, he showed that the language of the New Testament was generally the koine (common) Greek of the day. The papyrus about which Deissmann writes comes from the second century A.D. It tells of a young man named Antonius Longue from the village of Caranis in the Fayum of Egypt. He quarreled with his mother, left home, engaged in loose living, and running up debts. I beseech thee, mother, be reconciled to me! I know that I have sinned. Deissmann comments on the value of an account like this in the study of the New Testament. He also points out that the term reconciled is the same one used in the New Testament in texts like Matthew 5:23-24. If you have an opportunity to visit Jordan you should make an effort to see the RACE show at Jerash. RACE stands for Roman Army and Chariot Experience. You will see actors in authentic dress as armed legionaries, gladiators, and a short chariot race. The show takes place in the Roman hippodrome of Jerash. The view of the city ruins in the vicinity make this a wonderful setting for the performance. Full details may be found here. 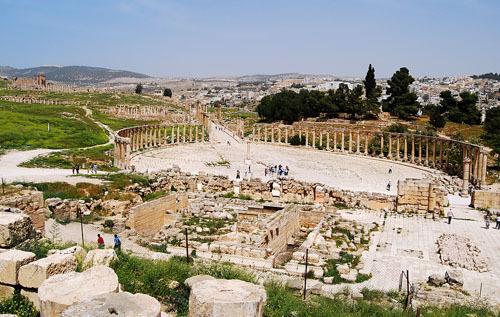 Jerash was the second largest city of the Decapolis (after Damascus) in New Testament times. People from the Decapolis followed Jesus during His ministry in Galilee (Matthew 4:23-25). When Jesus traveled through the Decapolis he possibly visited the area around Jerash (Mark 7:31). 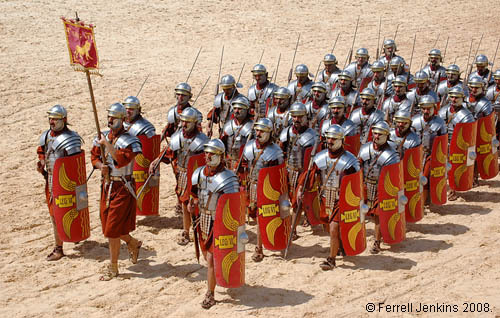 The photo shows the Roman soldiers of the 6th Legion from the time of the Emperor Hadrian (A.D. 117-138). A visit to this show provides several good photographs to illustrate New Testament times.